Commander Eldomain: Just who are you?Emeraldas: I am Emeraldas. A young boy, Hiroshi Umino (Megumi Hayashibara), steals his way aboard a space freighter headed for Daibaran, a planet where he hopes to find the man he aspires to be like. En route, the ship comes under attack by the Afressians, a race of aliens flying the flag of the Jolly Roger, who are attacking at random throughout the galaxy, purely for the amusement of its commander, Eldomain. When all seems lost, a mysterious force field appears, blocking the fire from the Afressian ships; then, materializing out of nowhere, comes the form of a huge space battleship�zeppelin-shaped, with a pirate ship dangling from its belly�that proceeds to destroy the vast majority of the Afressian fleet. The command ship retreats, the battleship vanishes, and the cargo ship makes its way to its destination. Discovered in the cargo hold, Hiroshi and another stowaway set out on foot in the rough outworld town, where the boy's tenacious and independent attitude lands him a job in the local saloon. Meanwhile, after being reprimanded for his failure in battle by Afress leader Bararuda (Yoko Asagami), Commander Eldomain (Hirotaka Suzuoki) begins a seek-and-destroy mission for the ship that got in his way, leading him to the very saloon where the crew of his last target have gathered. While the rest of the customers cower in fear, Hiroshi stands up to the bandits, outnumbered and unarmed. First officer Gamoru (Juurouta Kosugi), a man with no sense of morality, is about to lay waste to the pernicious youngster, when a tall, hooded figure suggests the bandit fight fairly, without weapons. He concedes, talking on the much smaller and weaker Hiroshi, whom he betters with ease. Although sustaining an insanely lopsided share of the damage in the altercation, Hiroshi refuses to give up, until the Afressian draws his weapon and the hooded figure intercede. Asked to reveal her identity, she lets fly her cape, revealing the skull and cross bones adorning her chest. Enter Emeraldas (Reiko Tajima), known and feared throughout the galaxy, travelling alone through the sea of stars, and one of only two worthy to fly the pirate flag, a point she makes unmistakably clear...Queen Emeraldas has her origins in the 1978 manga by Leiji Matsumoto, whose vast world encompasses everything from his 1970s manga and TV series Space Battleship Yamato (Americanized as Star Blazers in much the same way, but prior to Robotech), and the subsequent Galaxy Express 999 and Captain Harlock series set in the same universe. 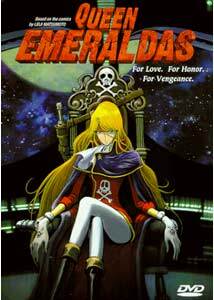 The two part, 1998 Queen Emeraldas OVA was the second DVD announced by ADV, and the first feature to give Emeraldas her own center stage, despite many appearances in the spinoffs of Galaxy Express 999 and Captain Harlock. Queen Emeraldas combines old school character design, which I particularly enjoyed, with CG for her ship's space sequences, creating an odd blend, but one that works, if you can accept the somewhat dated and unrefined computer animation. The story covered here has a definite, if unsurprising ending, and apart from references to her cohorts from the Harlock series (who make a cameo appearance), felt self-contained. The characters are interesting, the pacing good, and even with its relatively short running time, encompassed enough to make it worthwhile. Understandably, only the few main characters draw focus, but there is a reasonably-sized ancillary cast, including a scraggy, but cute red cat who figures in some of the action. The space battles are on a grand scale, with some cool ship designs. The overall atmosphere was a lot darker in spirit than many shows, though still aired a comic sensibility when required. I'm sure that being more aware of the whole Captain Harlock saga would flesh the character out more, or Emeraldas' background as seen in the Maetal Saga, but as my first excursion into Matsumoto's work, it has piqued my interest in seeing more. This OVA contains some great action, nice production, and an involving story—I just wish there was more! Image Transfer Review: Image quality is generally very good, with well-saturated color, and solid black levels. There is some aliasing, and some lower-resolution scenes where this is more pronounced. The CG is sometimes a bit choppy, and exhibits some stairstepping on the edges. There is minimal minor rainbowing. Audio Transfer Review: Original Japanese plus a decent English dub, and additional French tracks are provided. Tonal quality is well-balanced, with no excessive sibilance, and no technical flaws were noted. Stereo usage is quite respectable with a fair amount of directionality, and the musical soundtrack is presented well. The mix for the Japanese and English tracks is fairly similar, with clear dialogue, the French track's score is mixed noteably lower, and therefore not as powerful. Extras Review: Extras are limited to character bios, which are best saved until after viewing the OVAs. The packaging states 15 previews, however there are only 12 in total, which includes one for the main feature. Also included are Tekkon, Slayers: The Movie, Legend of Crystania, Sonic the Hedgehog, Sakura Wars, Battle Angel, Bubblegum Crisis: Tokyo 2040, Burn Up W, Neon Genesis Evangelion, Ninja Resurection, and Those Who Hunt Elves.Motion menus have decent length audio from the program as a background. The audio selection interface is the older ADV style, which provide less visual feedback to what has been selected. A highly enjoyable two-part OVA, based on the Captain Harlok and Galaxy Express 999 universe and characters. I liked the unique character design, and the story had good pacing with a satisfying conclusion. The presentation, while not perfect, was quite good for an older disc, and this introduction to Leiji Matsumoto's has me hungry for more. Recommended!